The text and screenshots herein are copies of Lytro’s official support articles, provided here purely to help remaining Lytro camera users experiencing problems. We have only included the most relevant support articles for this purpose. 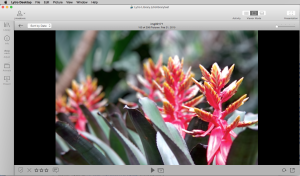 The Animate tool in Lytro Desktop 4 is designed to allow you to easily add animations to your living pictures. Available animations include transitions through various combinations of focus, pan, zoom, perspective, aperture, and tilt, which you can use to direct viewers through your living pictures as you’d like them to be viewed. To access the animation tools, click on the Animate icon in the Sidebar of Desktop. This will open the animate panel. Animations are added from the left-hand panel, and modified using keyframes. The animation panel will open with the currently selected living picture. Living pictures have a starting and ending keyframe, by default, displayed in the timeline. When a living picture is opened in the animation panel, the starting and ending keyframes will be displayed by default. Note: Fast is the recommended setting for exporting animations as movies. The quality in the fast and best settings are comparable, but processing times will be very long for best-quality rendering, even on high-performance machines. Presentation mode allows you to display your living pictures in fullscreen mode so you can present a slideshow to friends and family. Use an album, choose a view, or flag a set of pictures and you’re ready to go! You can start your presentation from any collection of pictures you like: either a view (all pictures, flagged pictures, etc) or an album. NOTE: Your presentation will always begin from the selected picture in that album or view. Click on the ‘Begin Presentation” button and you’re in business! You can export pictures from any of the three picture Viewer Modes (Thumbnail Grid, Individual Picture, Filmstrip) that Lytro Desktop 4 offers. Full Color 3D Image (.jps) – Export a full color .jpg Stereoscopic image. 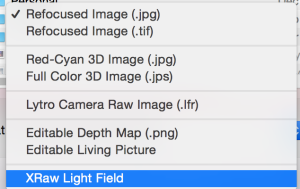 Lightfield Camera Raw Image (.lfr) – Contains all light field data. Appropriate for backups. Use this option for archival purposes, or whenever maximum picture fidelity is desired. These files contain all the data captured by the Lytro camera. XRAW – Contains all light field data AND camera calibration data. For sharing full living pictures on computer with Lytro Desktop that do not have pairing (calibration) data. You can edit these 7 TIFF images in your choice of 3rd party editing software (any that supports .tif images), and then reimport the stack lfp file back into Lytro Desktop. This will apply the edits made throughout the TIFF stack to your living picture. 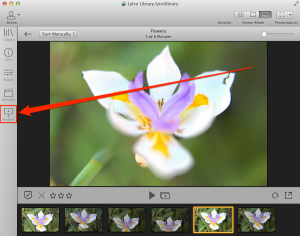 You can read more about editing living pictures in 3rd party software here. The Editable Depth Map (.png) is a layer of data that defines the distance of various surfaces from the lens of the camera, like a topographic map of that image. Select one or more pictures. If you wish, you may Flag these pictures and/or create a new Album from these pictures to speed the export process. Click once within each picture to choose the focus plane that will be exported for each picture. The Individual Picture with Filmstrip view is ideal for quickly cycling through multiple pictures to choose a focus plane in each. If necessary, re-select the pictures you wish to export. Keep the default export option, JPG, or select “refocused image (.tif) to export a .tif image. If multiple images were selected, your exported pictures will then be automatically numbered “_1”, “_2,” “_3,” and so on, after your chosen file prefix. Exported 2D images can now be cropped, printed or manipulated in your favorite imaging software. The native “Preview” application within OS X, and the native “Windows Photo Viewer” program in Windows, can be used to open and print any JPG file. 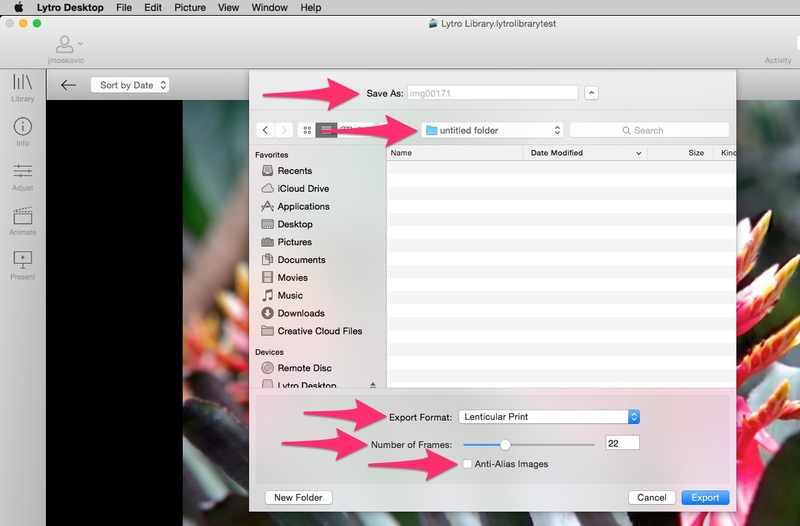 Lytro Desktop 4 itself cannot display or print exported JPG images; Lytro Desktop 4 only displays living pictures (LFP files). These files contain all the data captured by the Lytro camera. RAW files are roughly 50 MB apiece. 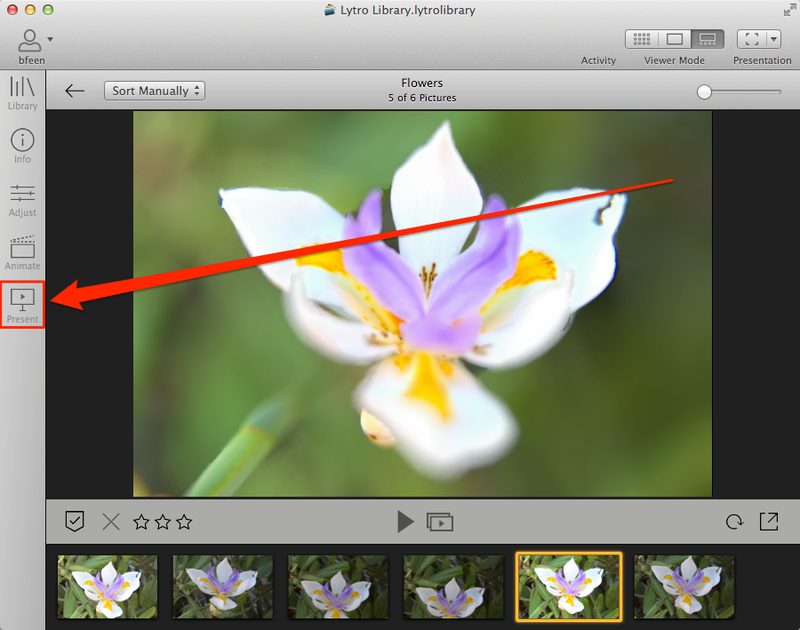 You can read more about editing living pictures in 3rd party software. 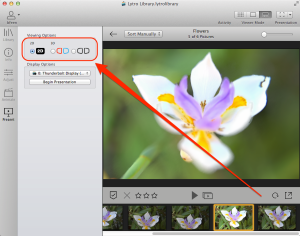 Your exported pictures will then be automatically numbered “_1”, “_2,” “_3,” and so on, after your chosen file prefix. 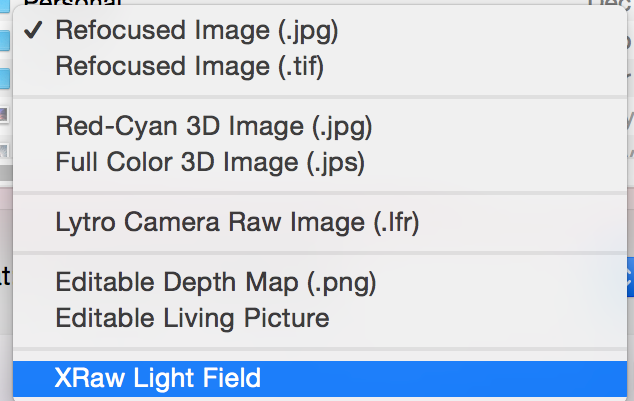 Both LFP Stack images and RAW images can now be imported into any existing Lytro Library using the top-level “File” > “Import from Folder” option. Note that the LFP / RAW images must be in a folder; for instance, you cannot import loose images from your Desktop. Lytro Desktop allows users to duplicate their living pictures. This is a great tool to provide a backup of your original RAW images before making adjustments. 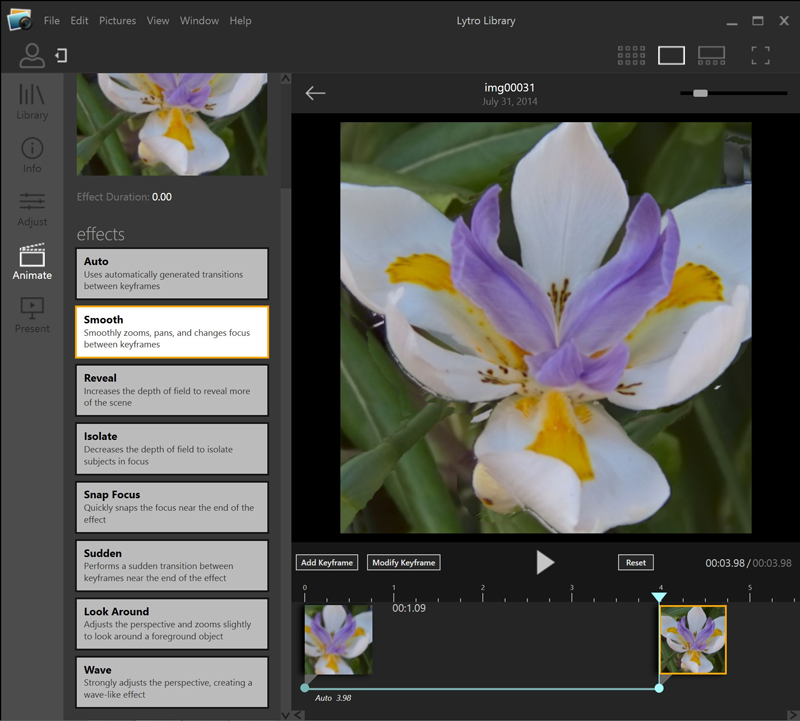 By duplicating a living picture file users can take one and make adjustments in Lytro Desktop, export as an ‘editable living picture’ stack to edit in 3rd party software, and reimport the image while still maintaining another original file, just in case. a. Name your movie by typing in a name. The file extension will be .mp4 by default. b. Use the drop down menu to choose a location for your movie to save to. 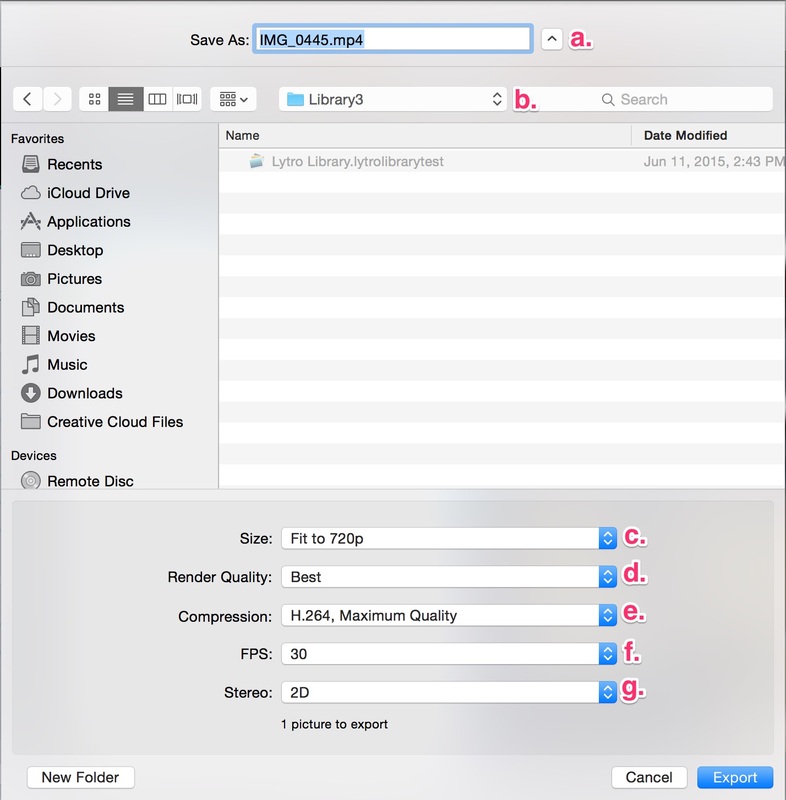 After exporting is completed, you can move the movie file to a different location. c. Size: Choose Fit to 720p or Fit to 1080p. 1080p will be higher quality, but take longer to process and produce a larger file. d. Render Quality: Choose Fast or Best. We recommend using Fast, as the quality difference is minimal, and the processing time for best will be very long, even with a performance based machine. Fast replicates the viewing quality and experience available on most computers. e. Compression: Choose from H.264 Maximum Quality, H.264 Balanced, H.264 Maximum Compression, or PNG Series. The H.264 compression options are standard compression formats available for movie files. For more information on Lytro 3D output, see below. 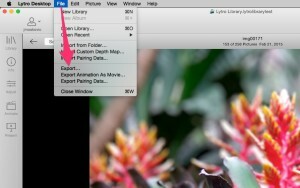 Once you have selected options for a-g, click “Export” to export the animation as a movie file. Once complete, navigate to the destination selected in option b to find and view the file. You can then play the video with any compatible video player – any video player that plays .mp4 files should work. You can also edit the exported movie files in any 3rd party NLE (non-linear editing) software that is compatible with .mp4 files. ‘Number of Frames’ selects how many views are generated between the minimum and maximum perspective view points. The range is between 10 and 50 images. More images will result in a smoother experience overall. ‘Anti-Alias Images’ smoothens the experience of viewing a lenticular print by averaging frames to reduce artifacts that can be seen when a user’s viewpoint changes. This feature results in a slight loss of resolution but is recommended when exporting a lenticular file using over 12 frames. The Lytro software ecosystem supports various 3D options for you to explore and share with your friends and family. We support 2 different kinds of 3D output: Anaglyph, aka Red/Cyan, and Side-by-Side. Anaglyph – To view Anaglyph output, all you need are a pair of Red/Cyan glasses. These can be had for cheap and are widely available on the internets, just search for “red cyan 3d glasses”. Side-by-Side – To view Side-by-Side output, you’re going to need a 3D TV and the glasses that came with it. We don’t officially support 3D computer displays, but that doesn’t mean it won’t work for you; lack of real industry standards means that we just can’t guarantee it. Got a 3D TV? Enter into 3D mode (your remote probably has a ‘3D’ button) and select Side-by-Side viewing from the menu system. Put on your TV’s 3D glasses and enjoy. With Lytro Desktop 3.1.0 or higher, you can view your living pictures in 3D, either in Anaglyph (Red/Cyan glasses required) or Side-by-Side (3D TV Required). With the Lytro Moble 1.2 or higher, you can wirelessly transfer pictures from your Lytro Camera to your supported iOS mobile application, and then export and view them on your mobile device (Red/Cyan glasses or 3D TV/Viewer required).